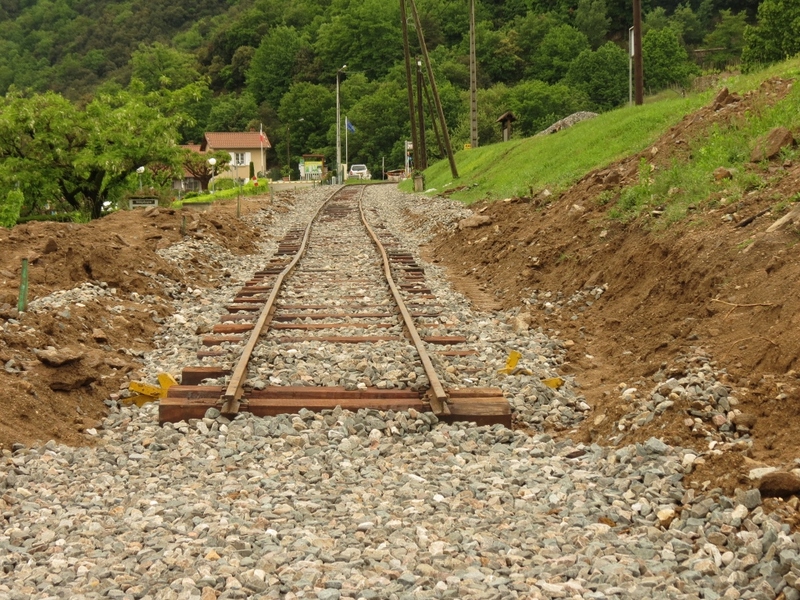 Compare this picture with the scene on July 9th, the first day of the traditional Autorail service to Lamastre market, and it is obvious that things have changed! 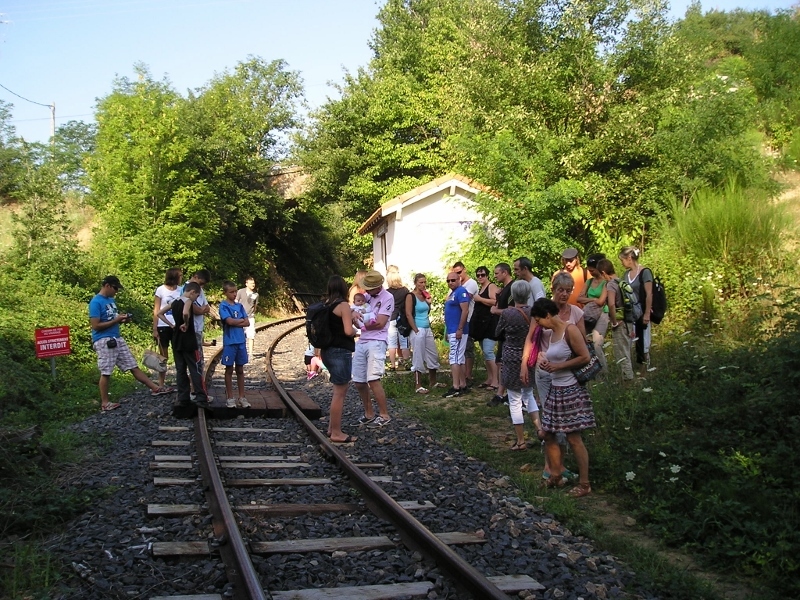 In fact, on the second Tuesday we waited and waited for the train to show up, together with a young couple from the campsite, who told us they would have given up if they had been the only hopefuls at Arlebosc station. Eventually, to our immense surprise, this is what hove into view! 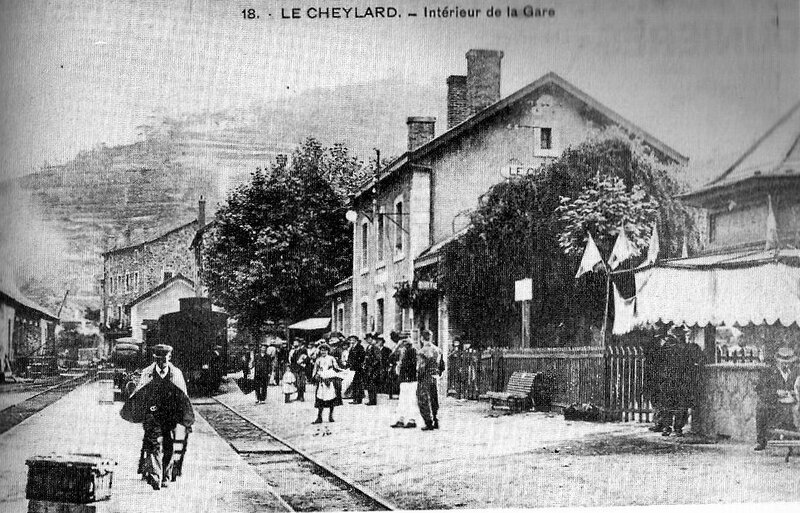 It transpired that when the staff came to open the station at Tournon, there were already 220 people ready to board the train and emergency measures had to be deployed. Le chef instantly decided that there was only one solution and hitched the new panoramic cars to the BB404 diesel locomotive and set up off the valley. By the time they reached Arlebosc they had 250 passengers on board. 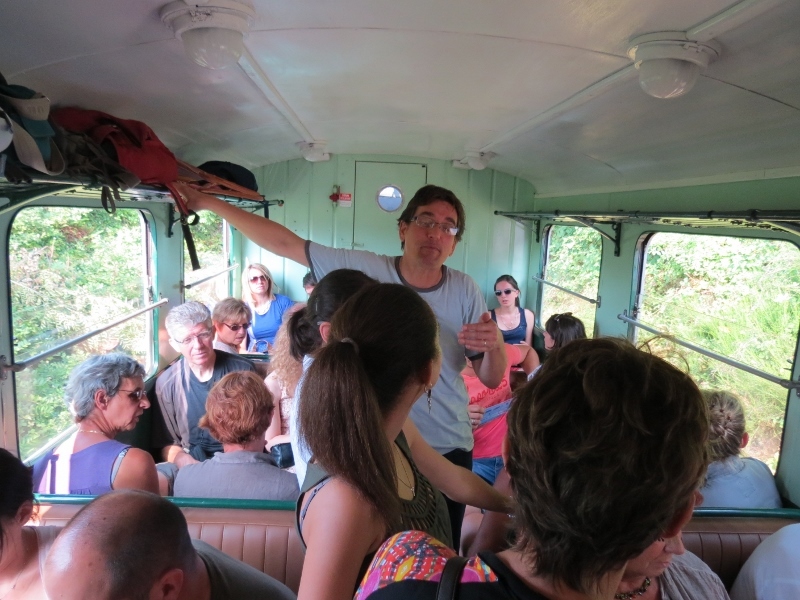 The following week we were 350 and for the last two Tuesdays the train has been at full capacity with over 500 passengers in eight cars. Within a week a new platform and temporary toilets had been built at Lamastre station to cope with the unexpected influx of visitors and overhanging branches along the line had been trimmed back to protect the passengers in the open sided carriages from nasty scratches or worse. Lamastre hardly knows what has hit it as the crowd streams over the bridge into the market and, just before twelve o’clock streams back again to the station, carrying bags of melons, baskets of saucisson, local cheeses and peaches, along with inflatable boats and fishing nets for the children to play with in the river once they get home. 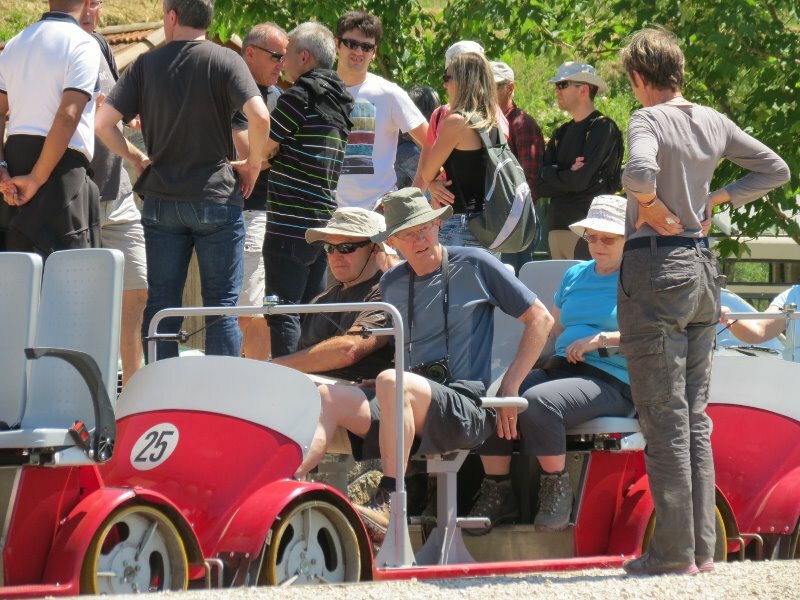 We have made new friends on these Tuesday excursions and frequently meet old friends who have come up the valley from Tournon, or even from further afield. There is no doubt that everyone is thrilled to have trains back on the line again. PS. Assiduous readers of this blog will remember our initial encounter with le chef and his dalmation at the start of our adventure with the sleepers for our garden project. We have now got a measure of the gigantic engineering undertaking which he has been supervising for the past eighteen months and our admiration for him knows no bounds. 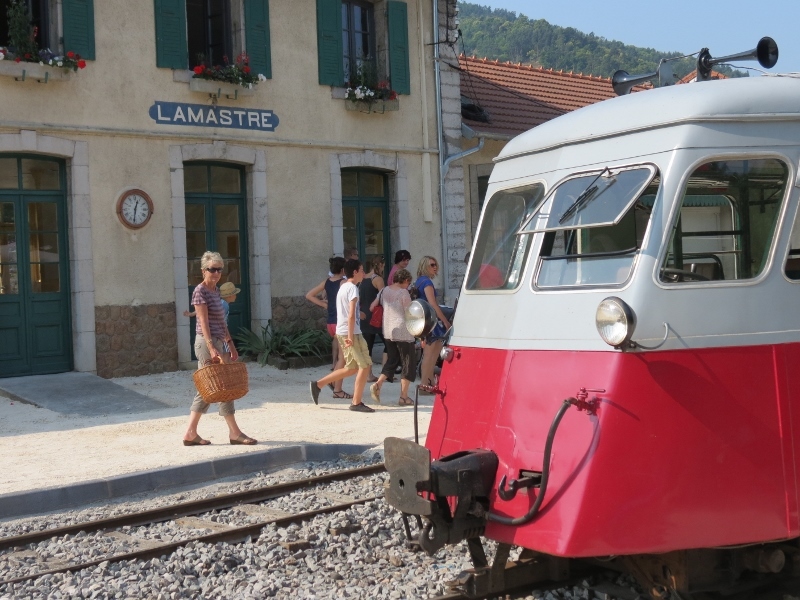 He seems to be everywhere at once: driving the train, answering questions from interested passengers, topping up and turning the locomotive or giving a saucepan of water to the geraniums outside the station in Lamastre. And we are delighted to discover that his faithful (though somewhat smutty) companion is always at his side. 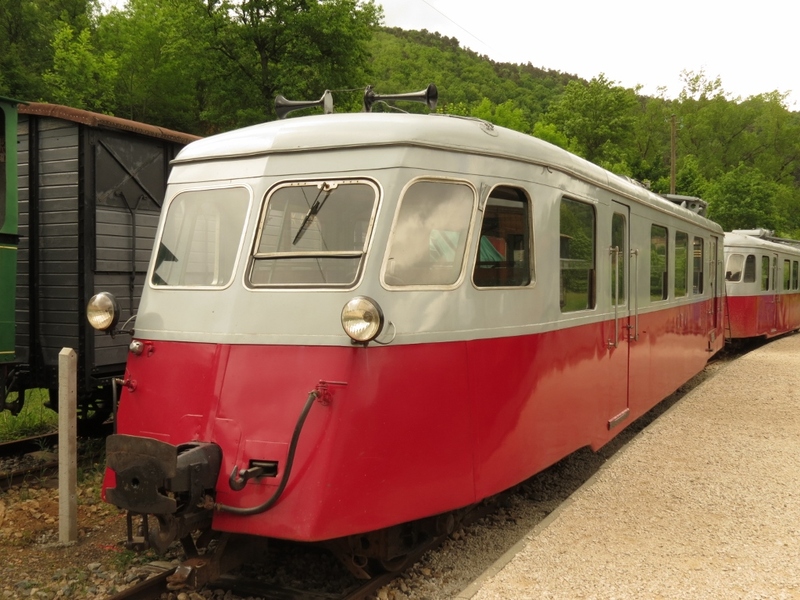 On July 2nd, as promised, the Mastrou made its inaugural run from the new station at Tournon – St Jean de Muzols to Lamastre. 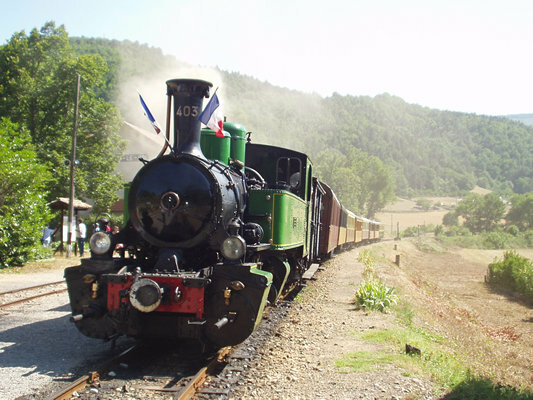 Packed with dignitaries and elected local and regional politicians (collectively refered to in French as les huiles) and drawn by the restored Mallet 403 steam locomotive it puffed and whistled its way through the gorge and then along the gentle valley of the Doux, proudly flying tricolour flags. 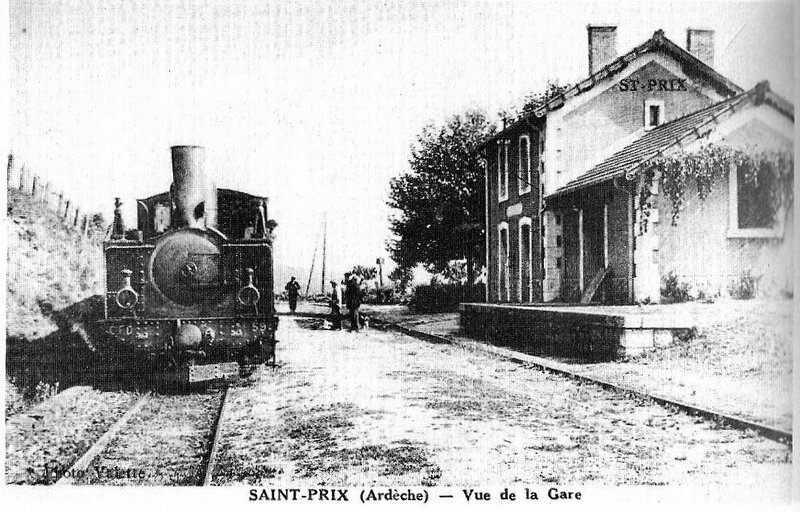 We were there to cheer it on from Arlebosc station, with a trumpet fanfare from Markus as it sped past. 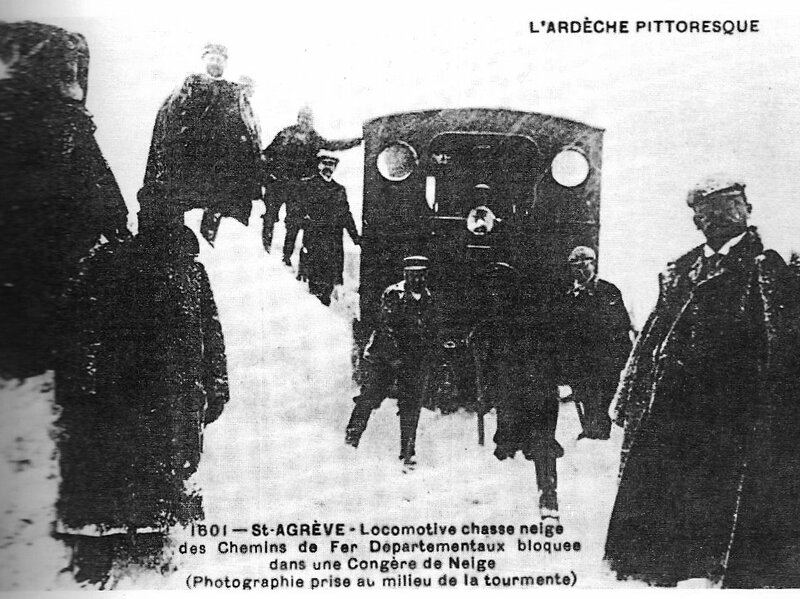 But what really excited us was the promised return of the autorail diesel train which used to run on market days. We remember this as a real institution. 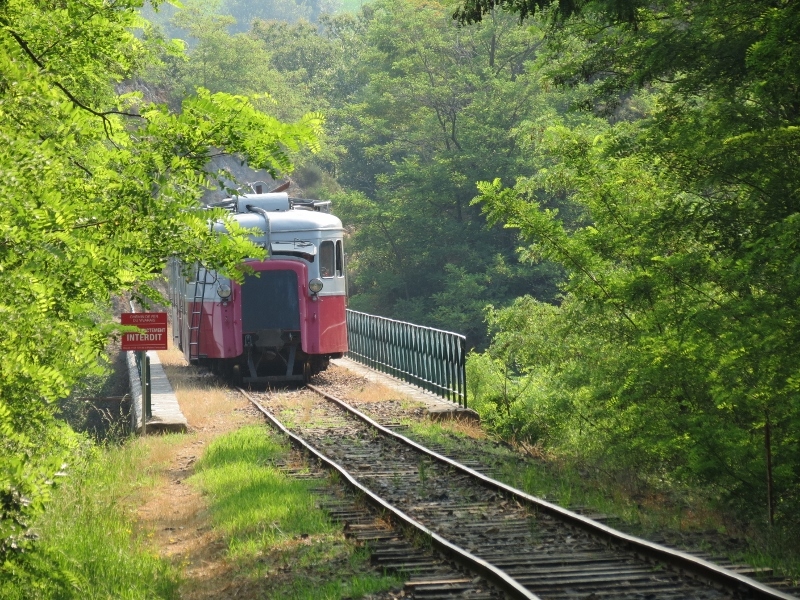 It would stop on request at any station, halt or wayside cherry tree to pick up country couples with baskets, as well as summer visitors from the campsites along the route. The return journey was always animated, the baskets now full of provisions for the week and everyone swapping the news and gossip they had picked up at the market. The husbands, who had been brought along to help carry a heavy gas bottle or a crate of live chickens, had had time to catch up with their friends over a glass or two and everyone was looking forward to lunch. 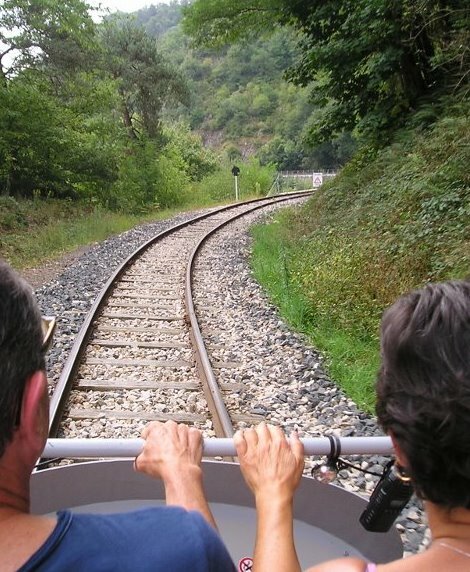 The train gradually emptied out, depositing its passengers as close as possible to their homes before chugging off down to Tournon. For the moment the steam trains are not coming up as far as Lamastre, so no one was sure whether the market train would really run, and no one seemed to believe us when we said we proposed to flag it down at Arlebosc station (which Markus insists on referring to as Arlebosc Central even though it is no such thing!) We arrived at what we had calculated to be an appropriate time and reflected whilst we waited that the station could do with a sweep out, a bit of weeding and a lick of paint – maybe a project. 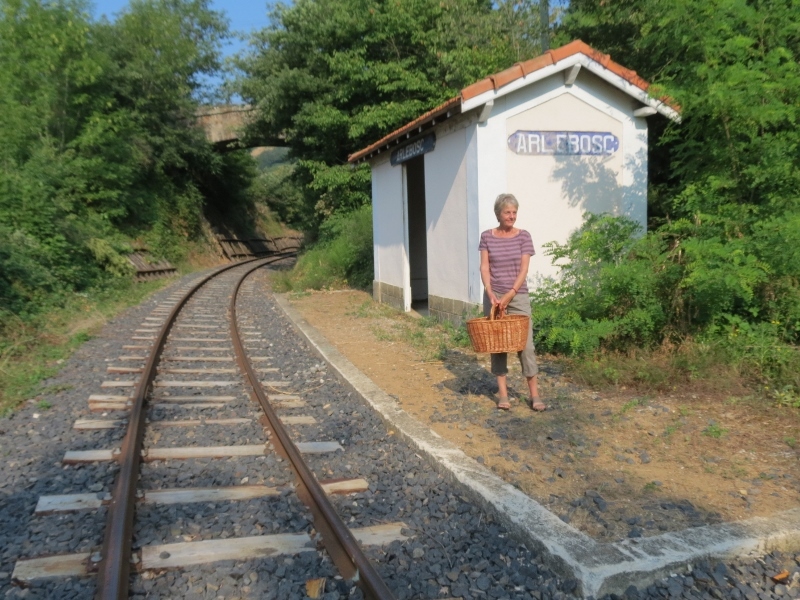 Then two chaps turned up and, obviously taking us for a couple of townee lunatics (one dresses up for market day in Lamastre), assured us that there would be no train. 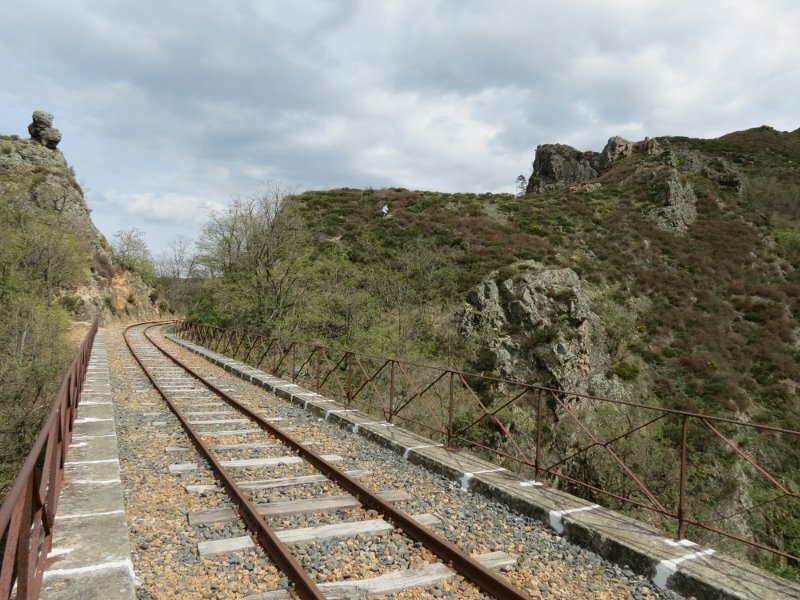 We held our ground however and they regaled us with great stories from the past, including a rather improbable account of an encounter between the autorail and a cow on the line in which the former came off worst. And then . . . . toot toot toot . . . . we heard it approaching round the curve over the viaduct! Markus took photos whilst Kate confidently held out her arm, basket much in evidence. The train slowed, stopped and, to everyone’s vast surprise the conductor got down, sold us our tickets (4€ return each) and we piled on board. It was standing room only by this time. She told us that she had 114 passengers in the two cars, which is the maximum she is allowed to carry. The ride takes twenty minutes and is truly enchanting. The landscape is still completely unspoiled and the track winds along the course of the river, past farmsteads and through orchards and meadows just as it always did. 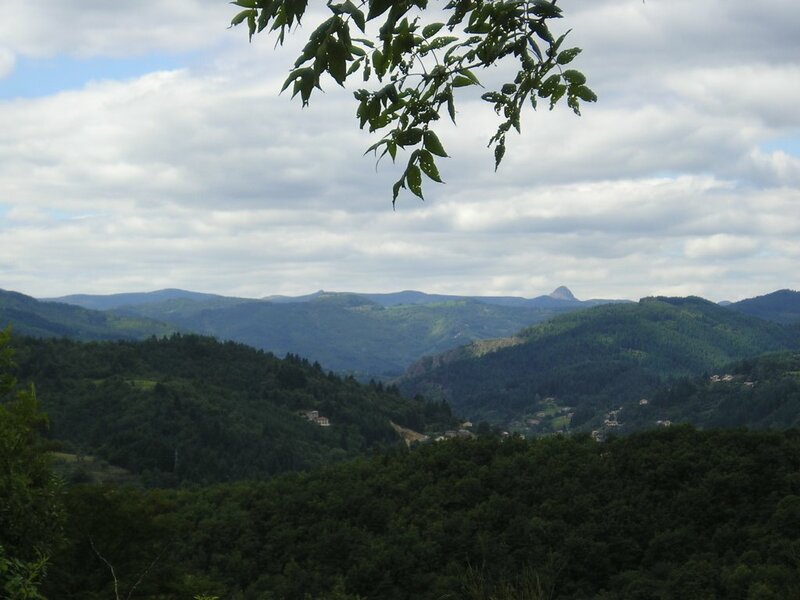 It was this journey that started off our love affair with the Doux valley one magical May day twenty five years ago and nothing has changed. We pulled into Lamastre on time at 10 am and walked from the station over the flower decked bridge into the bustling market. We had the perfect amount of time to get everything done before leaving again at 12 noon. As we approached our stop the conductor called out “la gare d’Arlebosc, une minute d’arrêt!” We wished everyone bon voyage and bon apétit and made our way home, vastly pleased with our morning. 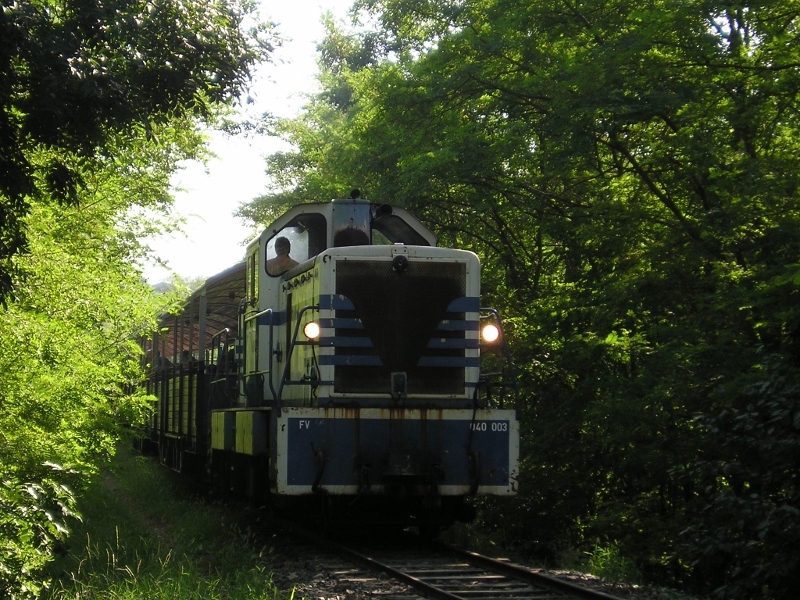 It is wonderful to have our train back and, although the service is still a bit limited we feel very positive about the future of the line. At all events, we shall certainly be at the station with our basket next Tuesday to take the train in to market.